Kenya has been headed for greater heights, ever since the coming of Barrack Obama. In fact, this product has been very helpful in marketing the country abroad,and in transformation of various places overnight. An example of such a place is Kogelo, which was considered to be so remote that the Rural Electrification Board did not cover it. Overnight, the sleepy village(as a journalist likes to refer to it[maybe one of those sex_for_jobs journalists]) has been transformed to a top priority electrification site, and has already been electrified. Maybe, as we may be led to believe, it has nothing to do with Kenyan men spreading their fruits elsewhere(and bearing future senators). It may be as a result of a iRRI(intermittent Rapid Results Initiative. The RRI(iRRI), has been responsible for such other developments, such as Police riding in normal cars (other than mechanized carriages once known as Mahindra), disappearances of Maize stocks, Fuel disappearances, KPLC blackouts etc. 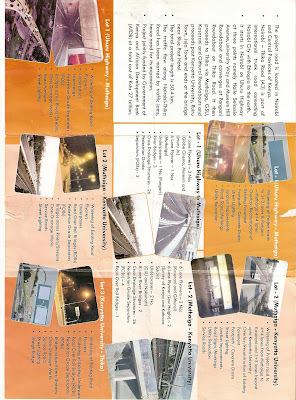 Amongst one of the best products of the iRRI, is the proposed Thika Road Expansion, as shown above. This Road will be complete by 2030. Phases in the construction of this road -needles to say- will be carried out intermittently, by Cowboy contractors. 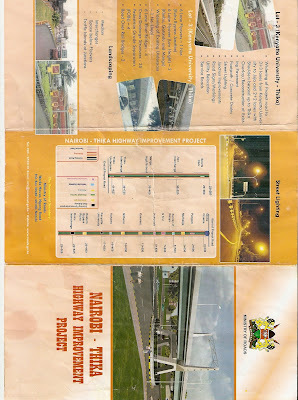 Phase one, which is complete, included creation of wide spaces next to the road in some select areas, such as "Roasters" and the "Roysambu" roundabout. due to the intermittent nature of this program, we do not know when the next phase will be carried out, but be assured, it will be soon and sudden. You can read the above brochure for further information.